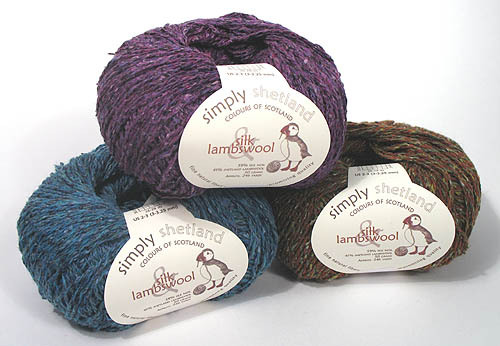 Camilla Valley Farm is pleased to offer these Shetland Lambswool Blends from Simply Shetland. 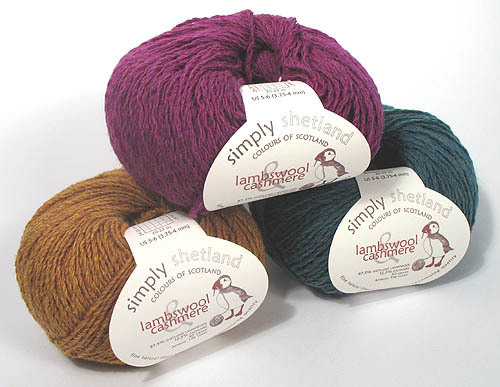 Spun in Scotland, these blends of Lambswool with Silk and Cashmere are an ultrasoft choice for your next knitting project. These yarns are also designed to allow them to be substituted in many of the designs calling for Jamieson's Shetland Wool yarn. Information on this can be found below. We currently stock all colours of both yarns for quick shipment. This is a Jumper weight blending of Shetland Lambswool (41%) with Silk Noil (59%) which is spun for Simply Shetland in Scotland. All colours are a heather blend and the yarn knits up 26 to 28 stitches and 30-32 rows in 4 inches (10 cm) using 3-3.25mm needles (US size 2-3). The yarn comes in 50 gram (1.76 ounce) balls with a yardage of 246 yards (225 metres) per ball. A single strand of his yarn can be used as a substitute to Jamieson's 2-ply Spindrift. See the Duxbury Point Pullover pattern for an example of a garmet knit with both yarns. The yarn can also be doubled and used in a pattern calling for Jamieson's Heather Aran wool. See the Drake's Bay Coat and Drake's Bay Jacket for examples of this. Other patterns in the book Simply Shetland 4 using this yarn are the Ella Jacket, Dillon Beach Pullover and the Silk Diamonds Scarf. See below for colour samples and ordering information for the 16 colours of this yarn. This is a Double Knitting (DK) weight blending of Shetland Lambswool (87.5%) with Cashmere (12.5%) which is spun for Simply Shetland in Scotland. All 16 solid colours knit up 20 to 22 stitches and 24-28 rows in 4 inches (10 cm) using 3.75-4.0mm needles (US size 5-6). The yarn comes in 50 gram (1.76 ounce) balls with a yardage of 136 yards (124 metres) per ball. 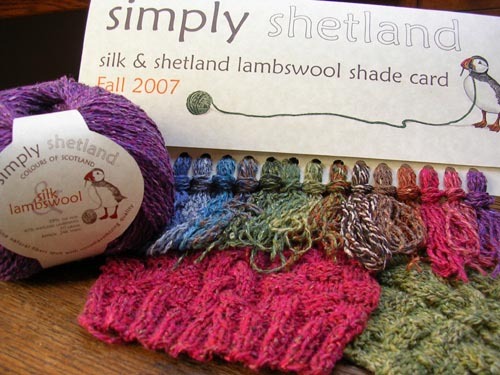 This yarn can be used as a substitute to Jamieson's Double Knitting (DK) yarn in any of the Simply Shetland or Jamieson's pattern books. Patterns in the book Simply Shetland 4 using this yarn are the Olema Turtleneck Pullover, Olema Hat, Tomales Bay Cowl, Rosalie Scarf and Glenice Wrap.